After paddling across the Kennebec, I lounged for a half hour on the southern bank, dabbling my hot feet in the cool water of Otter Pond Stream while I ate peanut butter and tortillas. From there, I made somewhat slow progress on the long, gently sloping climb beside Pierce Pond Stream, stopping twice to swim in deep buckets of cold, clear, greenish water. After four miles, I came upon a sign pointing to a battered bridge leading to Harrison’s Pierce Pond Camps. I hadn’t planned to stop, but now pouting that I’d passed up a chance for a milkshake in Caratunk, I decided to stop in and see if the proprietor might have a Coke or Gatorade. Tim Harrison did not have anything to sell, but I was immediately drawn to his place. A collection of wood-sided cabins with cockeyed doors and small wood stoves, and a main lodge with creaking, sloping floors, an array of large animal trophies on the wall, and a curious assortment of dusty books, maps and other curiosities, it reminded me somehow of William Faulkner’s famous novella, The Bear. It was only 2:30 and I’d planned to go farther, but on the spur of the moment, I decided to stay. I had a great time talking with Tim, playing with his clever little poodle puppy, Charlie, and lounging in the brisk waters of the stream just below my cabin, where fingerling trout waved like tiny flags in the current. I’d only come 40 miles from Monson, but I was beat. My feet, especially, were feeling the miles. The Hoka One One Mafate Speed trail runners that I’d started with on Katahdin (only because they were in my closet and I didn’t want them to go to waste) had not turned out to be a good choice. My feet, especially my right foot, were wider than they used to be, and it was beginning to look like the condition might be permanent; guess that’s what slapping them up and down on rocks and roots and hard earth several million times with 25 pounds of extra weight on your back will do to you. Now, the side of the ball of my right foot burned with sharp pain most days, squeezed just by the toe box of my Hokas, and the tiny sesamoid bones that lie beneath the skin between the ball of the foot and the instep felt like hot little BBs. My poor feet demanded to know why I didn’t stick with Altras, with their gloriously roomy toe box. I hear you, feet, I wrote in my journal. Gonna have to order some Altras soon. That night, I plopped down onto an ancient couch made of stiff leather in the lodge, where I pored over coffee-stained maps and old books until I nearly nodded off. I staggered down the hill to my cabin and fell asleep to the babbling lullaby of Pierce Pond Stream. Breakfast at Pierce Pond Camps is legendary. Tim gets up early to make coffee, then fixes up a mess of “red, white and blue” pancakes—infused with raspberries, blueberries, and something else—eggs, and sausage. Nobody else stayed in a cabin that night, but a dozen hikers had rolled in from nearby Pierce Pond Lean-to the night before to lay down $12 for the feast. And then, for dessert, my day started out easy, with 10 miles that are easily among the top 20 easiest miles on the AT in Maine. Mostly level, the tread is intermittently Maine-ish—roots and rocks—but also offers regular relief on soft, duffy singletrack. The day was partly cloudy and pleasantly cool for walking, so much so that I bypassed an opportunity to get wet at West Carry Pond (NOBO mile 2023.9; SOBO 165.2), flagged in Awol’s guide for excellent swimming. For the first time since I could remember, I was moving faster than 3 mph. By the time I stopped to eat lunch on a stony beach on gorgeous Flagstaff Lake, a stiff breeze was driving whitecaps ashore. Once again, I decided not to swim, and maybe that was a good sign: It was the first week of September and maybe, just maybe, my endless days of swampy sweating were finally coming to an end. To the southwest loomed the Bigelows, the first “real” mountains since Katahdin (though I’d found bumps like Whitecap and Pleasant Pond plenty steep and challenging). Patches had told me the Bigs were beautiful, but I could see in Awol that they were also as jagged as cougar teeth, as were Crocker, Spaulding, the Saddlebacks, Bemis, Old Blue, Baldpate, Mahoosuc, and others down the trail. I had now finished the “easy” parts of Maine, and the training wheels were about to come off. In the next 100 miles, I would be climbing or descending 11 of the 20 steepest half-miles and nine of the 25 steepest miles on the Appalachian Trail. 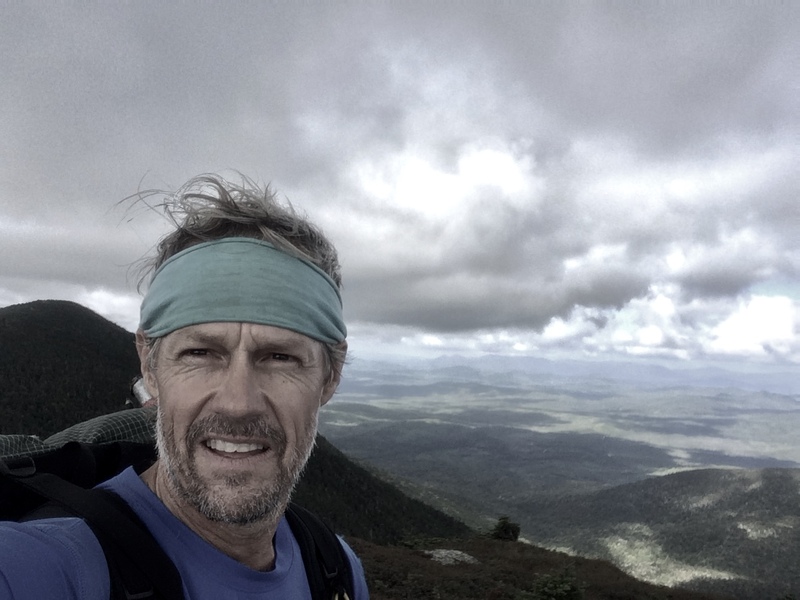 “The AT since Gorham (N.H., about 17 miles from the Maine state line) has been as challenging as the trail anywhere,” Awol observes in his memoir after he’s finished the legendarily challenging White Mountains of New Hampshire (emphasis mine). Ninja Roll. From his Facebook page. On a whim, that morning I’d decided to count the number of NOBOs I passed. The final tally blew me away: 51, not including day hikers. That number included many hikers I’d not just met, but spent at least a little time with on the trail—Mudpuppy, Ninja Roll (a Louisianan who wrote “Laissez le Ninja Roll!” in every logbook), cheerful German Refill, who had road-walked most of Shenandoah at night, and Tumbleweed and Shiv, the honeymooning, organic-farming couple from Florida with whom I’d camped after Unaka Mountain and at Overmountain Shelter in Virginia. I had already seen many friends and acquaintances, and over the next couple of weeks I would see many, many more. Beginning to feel like Old Home Week, I wrote in my journal. The nearly 2,000-foot climb up to the plateau of Little Bigelow Mountain doesn’t make any “steepest” lists, but it felt like a long slog for late afternoon. I was good and tired when I stumbled into the Safford Notch Campsite after 23 miles and 3,700 feet of climbing. While I pitched my tent someone up the hill had cranked up a tinny AM radio talk show, shattering the peace of the woods and setting my teeth on edge. After getting water from the trickle below the camping area, I walked up the hill until I zeroed in on the sound. As loud and opinionated as I can be, I will often avoid confrontation over such things, as when I chose to pack up and walk to another shelter near dark when Overdose and her crew interrupted my quiet enjoyment of South Mount Wilcox Lean-to. I made my request in a neutral voice, with a smile, then turned around and headed back down to my tent, hoping the guy wasn’t as mean as he looked. Somewhat to my surprise, he turned the radio completely off. Ahhhh…. As I passed her tent, a German woman who’d set up near me gave me a conspiratorial thumbs-up. The temperature when I rose at 5 the next morning was a wakeup call. It was still above freezing, but not by much. The sun was out, but it was breezy and only got cooler as I made the 1,900-foot climb up to Avery Peak (named for trail pioneer Myron Avery), including—wait for it—the 25th steepest mile on the AT. I made good time, and once on top, I was rewarded with spectacular 360 views of Flagstaff Lake and endless miles of nearly unbroken wilderness. Chilly morn on Mt. Bigelow, with Flagstaff Lake below. Clay Bonnyman Evans. After a short dip and steep, short climb, I was atop Bigelow Mountain. The tread remained chunky and challenging for the next two miles as the trail dropped, then rose to the summit of South Horn. Looking at Awol’s elevations, it appeared that I had just one more mild ascent before a long, fairly steep trundle down to ME 27, where I planned to hitch into Stratton for a resupply. But the descent was hardly faster than the 2,700 feet of climbing I’d done since starting. Steep, rocky, rooty, and featuring many hidden PUDs (pointless ups and downs), it made for slow going. I reached the road at 11:30, which meant I’d been traveling less than 2 mph, and that included a relatively flat runout across Stratton Stream. Once again, the hitchhiking fairies were with me, and I only had my thumb out for perhaps five minutes before an older woman in a brand-new gray SUV stopped. She told me about a recent experience she’d had at the lodge on top of Mount Greylock in Massachusetts. She and her husband were eating at the ledge when she noticed a tall, dark-haired hiker. He was, she said with a brief giggle, an “extremely handsome young man.” They watched in amazement as the hiker ate what seemed to them an impossible amount of food in a stunningly short period of time. Tall, dark, handsome—I knew Tapeworm. We’d leapfrogged a little in central Pennsylvania and shared a ride up to Lehigh Gap from Palmerton. “Does he always eat that much?” she asked. “I only saw him eat once, and that time he accidentally dropped his cooking pot and spilled half the contents into the dirt right in front of a shelter in Pennsylvania,” I said, remembering how I’d scooped it up with a long-handled shovel to deposit it in the woods, just in case any bears turned up. She dropped me off in front of the White Wolf Inn, where I ate a big, leisurely lunch and charged my phone. While eating a piece of pecan pie I talked to Jody, then checked in with my sister to see how my mother was doing. I wasn’t particularly thrilled with the selection and high prices at Fotter’s Market just across the street, but I was too lazy to head back up the road to see if the Flagstaff General Store was any better. As I was packing up my food bag in front of the Stratton Motel, which had a $25 bunkroom, I was happy to see Dragon Head, the young engineer from Denver whom I’d spent time with in Pennsylvania. Last time he’d seen me I was sweating and shivering in the heat of mid-day at a shelter where I’d collapsed from as-yet-undiagnosed Lyme disease. I was glad to see he was now hiking with a female companion. I toyed briefly with the idea of bunking in Stratton, but hating to waste such a beautiful day—sunny and 70 degrees—I decided to head out. I walked for perhaps a half mile before a couple from Montreal stopped to ferry me the rest of the way to the trailhead. They were section hiking in the area, but peppered me questions about thru hiking. “We’d like to do that someday,” the woman said. They gave me some grapes, chunks of watermelon, and cheese for the road. For NOBOs, the trip into Stratton is a major milestone, as the trail crosses the 2,000-mile mark less than a mile south of ME 27. For me, that meant only that I’d walked 189.1 miles from Katahdin and I never even saw the assemblage of stones laid across the trail to announce the frontier. The trail wasted no time in turning steep and rocky on the five-mile climb to north and south Crocker mountains. It took me two-and-a-half hours to reach the north summit (NOBO mile 1995.7; SOBO 193.4) and I was completely drenched in sweat when I got there. But I was psyched to be descending what looked like a brutal climb from the Carabassett River valley to South Crocker, which encompassed the 12th steepest half-mile and 13th steepest mile on the AT. I could see a thin line of blue smoke rising from the trees in Crocker Cirque for a long, long time before I finally hit the campsite at 5:40. I was exhausted, having climbed some 5,700 feet over 17.7 miles. All my talk about scaling back mileage in the Whites, but today I figured out maybe I need to do that here in S. Maine, I wrote that night. It’s pretty brutal, tons of PUDs, steep, rocky. It’s not like I have to be anywhere, so I’m going to start aiming for 17-20s.